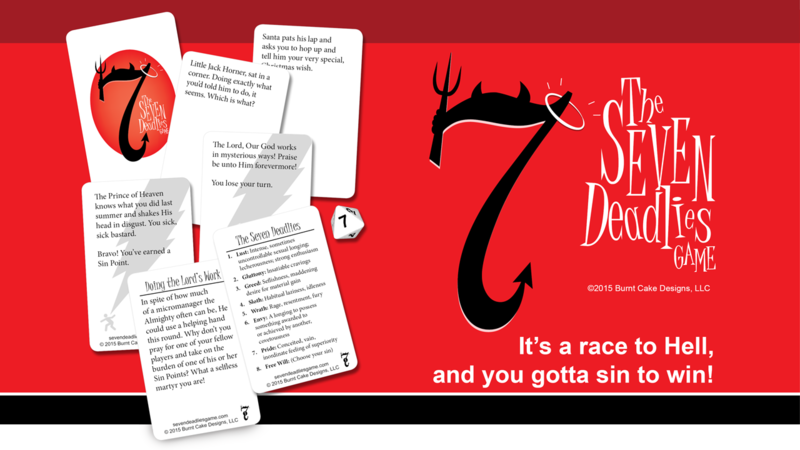 The Seven Deadlies Game – It's a race to Hell, and you gotta sin to win! Deadly Sins? As a game? View our Kickstarter promo video! Disappointing God and incurring his wrathful Divine Intervention (the lightning-bolt-smiting cards), which clearly should be your intent if you’re playing this game in the first place. It’s one thing to stage a game for the sake of a promotional video, but the guys stuck around after the shoot to play on their own. Here’s a video of how the Seven Deadlies really plays when there’s no script to follow! You might put on headphones if you’re catching this at work; the language gets delightfully colorful quickly!